Some 100 Palestinians and peace activists launched a one-month campaign at the West Bank Sunday, titled '30 days against the roadblocks'. Inspired by US Secretary of State Condoleezza Rice's visit to the area, some of the protesters chose to convey their message in an original way and dressed up as native-Americans. At about 11 a.m. the protesters gathered at the Hawara roadblock south of Nablus, and held up signs in English denouncing the military roadblocks across the territories. Several of the demonstrators, mainly children, were dressed up as native-Americans and wore traditional headdresses. The demonstration was organized by a group called 'Palestinians for Peace, Dialogue and Equality'. The protesters also criticized the difficulties created by the checkpoints, and the limitations they impose on the Palestinians' freedom of movement. One of the signs at the protest read, "The roadblocks are ruining the Palestinians' lives," while another poster aimed to juxtapose between the native-Americans, whose lands were stolen by the newcomers from Europe, and the Palestinians. 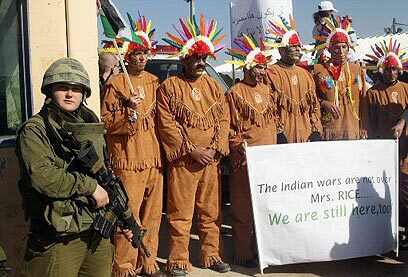 "The Indian wars are not over, Ms. Rice. We are still here too," the sign said. Rice met Sunday with Palestinian President Mahmoud Abbas. Abbas told Rice he opposes the establishment of a provisional Palestinian state in temporary borders. Rice responded by reiterating the US commitment to the Road Map. “My work is going to be best targeted, I think, in these next months on trying to accelerate progress on the Road Map, which after all would lead us then to a Palestinian state and to helping the Palestinians and Israelis think through the political horizon,” she said. See all talkbacks "Playing Wild West in West Bank "